LAHORE: (Tuesday, May 23, 2017): Higher Education Commission of Pakistan and Punjab University will establish China Pakistan Economic Corridor Integrated Study Centre at Punjab University to highlight the golden opportunity for development of Pakistan through media and counter negative propaganda against the project. 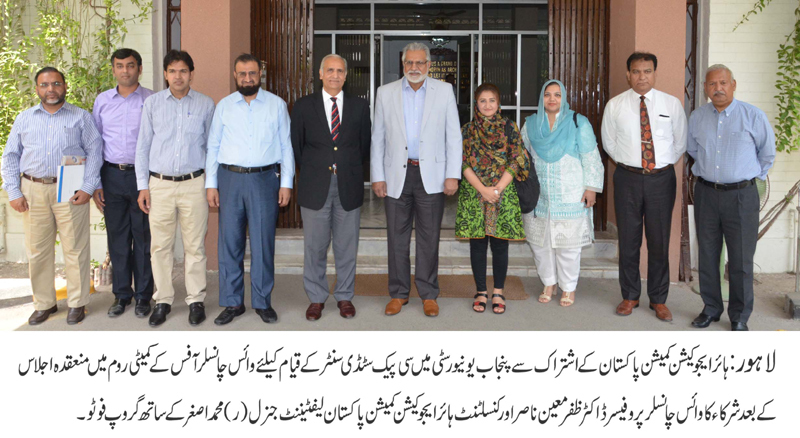 In this regard, Higher Education Commission of Pakistan’s Consultant and former Vice Chancellor of National University of Science and Technology Lt Gen (r) Muhammad Asghar, PU Vice Chancellor Prof Dr Zaffar Mueen Nasir, Director Institute of Agricultural Sciences Prof Dr Muhammad Saleem Haider, Incharge Institute of Communication Studies Savera Shami, Shabbir Sarwar, Amir Bajwa, Dr Zaffar Ahmed, HEC’s Director General CPEC Dr Safdar Ali Shah and other were present on the occasion. In the meeting, Lt Gen (r) Muhammad Asghar gave a detailed presentation on the CPEC and ‘one belt one road’ concept and said that there was need to create awareness among people regarding the fruits of the gigantic project. He said that every section of the society and country was going to benefit from the CPEC and it would bring Pakistan among the developed nations. However, he said, we need to create awareness among people, build positive narrative of the project and counter negative propaganda. PU VC Dr Zaffar Mueen Nasir assured that PU would play its role with full strength to implement federal government’s vision regarding CPEC. He instructed the PU team to prepare a concrete proposal within one week so that practical work could be started as soon as possible.